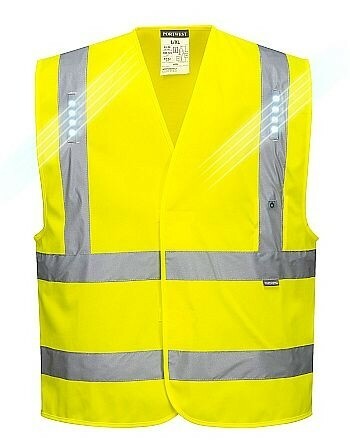 Vega L470 LED Vest is an LED High Visibility vest is part the a collection that uses LED's that enhance the users visibility. These lights paired with the bright florescent fabric and reflective tape offer some of the highest visibility in any weather conditions. These vests are fully certified and tested to the ANSI/ISEA 107 standard making this an ideal choice for those who enjoy a stylish look without sacrificing comfort or performance. Available in sizes S/M-2X/3X. 80 hours of charge time. Vega L470 LED Vest is an LED High Visibility vest is part the a collection that uses LED's that enhance the users visibility. These lights paired with the bright florescent fabric and reflective tape offer some of the highest visibility in any weather conditions. These vests are fully certified and tested to the ANSI/ISEA 107 standard making this an ideal choice for those who enjoy a stylish look without sacrificing comfort or performance. 80 hours of charge time.